Miah and I have some news that has been developing over the past weeks that we need to share with you. It will directly affect our involvement in the ministry at the 8:10 Project and your gifts/giving/support. I apologize I did not write earlier, but I’ve been waiting on some more information that doesn’t seem to want to come; so I thought it best to let you know what I know now and not wait any longer. Our family has made the decision to move to Warroad, MN to help my dad as he recovers from an accident and continues to adjust to life with chemo and other challenges. We are not sure how long this season will be, but are fairly confident that God has led us in the decision making process. This isn’t a decision we’ve made overnight or because we’re burnt out, discouraged, or failing morally. 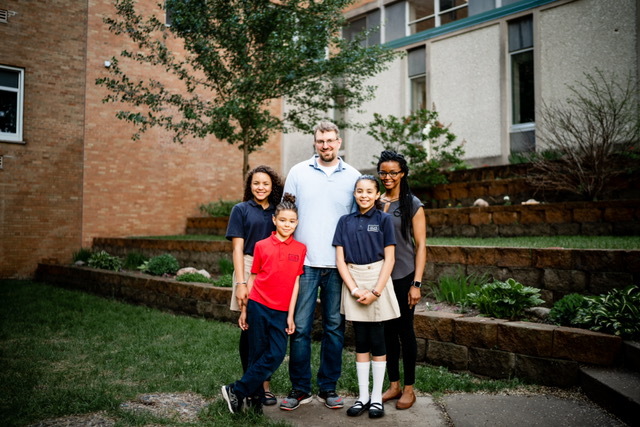 We remain excited to see the seeds of the Gospel grow and flourish in North Minneapolis. However, it’s become apparent that the Holy Spirit is leading us here. While we walk through this, we have decided not to take a salary from the ministry starting Oct 1. Some of the ministry will continue through faithful friends and partners in the area, but some will be scaled back. I will not be able to be ‘hands on’ in the outreach and discipleship efforts and will be concentrating on being a help to my parents and my wife and children in their adjustment. How THANKFUL we are for you! Your prayers, gifts, and love have carried us the past several years; and we are not exaggerating when we say that we could not have done any of the work without you! Starting Oct 1, our family will not be directly benefitting from your gifts. If you choose to continue giving towards the ministry, the funds will be used towards ongoing expenses for the ministry home (utilities/maintenance, ect). Extra will be kept in the ministry fund for later use. If you choose to end your giving at this time, we understand but would also encourage you to continue giving to Damascus Way. They’ve been a tremendous help and covering to the 8:10 project and have some exciting developments in the way of discipleship for men re-entering society from prison. We can also give you some ideas for trusted partners in North Minneapolis if desired. We really appreciate your prayers as we walk through this! In mid-june, we were informed that Miah would not be teaching at her school and that our partnership home was heading in a new direction for the Fall. We would need new housing and Miah would need a new job by Sept 1. At the time, we were excited and felt that God was finally leading us to a permanent home of our own in North Minneapolis. We began looking at several homes in the area; bidding on at least 5 of them. In early July, my father (who was diagnosed several years ago with Multiple Myeloma, a cancer of the blood effecting bone density) was involved in a motorcycle accident which broke several bones in his body. The news was disheartening, but we were optimistic for his healing and recovery. Throughout July, we continued to look at and bid on housing in N. Mpls; but we were mindful that some ministry would need to be cut back to allow us to make frequent trips to Warroad, where my father lives. As July turned to August, all of our bids continued to be rejected/outbid and even the rental market had tightened making it difficult to find affordable housing for our family. My father’s bones did not appear to be healing quickly and a friend offered us housing near Warroad. We struggled with the decision for some time, and finally decided in late August to register the kids for school and look for employment options in Warroad. To be honest, we were half expecting God to show up as we were making the decision and surprise us with a home in North…like the way He tested Abraham with Isaac and showed them a ram at the last moment:) We were wondering if He was testing our hearts and motives in ministry, but ultimately leading us to our plan of a home on the Northside. We know His ways are higher than ours, and we trust that we will look back on this whole experience with understanding and appreciation for His kindness and leadership. As we walk through it, we are often confused but also blessed with encouragement from our friends and family both in Minneapolis and Warroad. We are still waiting to hear about jobs here in Warroad and will keep you updated about developments with our family and ministry in Mpls. Again, thank you for your support and ongoing love for our family. We appreciate each one of you, and if you have any questions please reach out at any time!